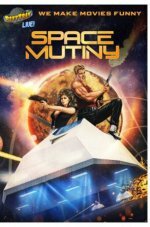 RiffTrax Live: Space Mutiny release date was Thursday, June 14, 2018. This was a 1 Day Only release. One of the funniest films featured on Mystery Science Theater 3000 in the Emmy® Award nominated show's 11-year run, “Space Mutiny” is a hilariously bad sci-fi epic that's guaranteed to have you in stitches. Combine a wardrobe of spandex and tinfoil; a set boasting AstroTurf® and spray-painted floor buffers; and special effects that, well, aren't so special, and you've got one of the most hysterical cheeseball movies to ever come out of the '80s. Grab your friends and have a riot with this underground cult hit. Presented in more than 700 select cinemas by RiffTrax and Fathom Events, “RiffTrax Live: Space Mutiny” screens live on Thursday, June 14 at 8:00 p.m. ET / 7:00 p.m. CT / 7:00 p.m. MT / 8:00 p.m. PT with an encore presentation on Tuesday, June 19 at 7:30 p.m. local time, through Fathom’s Digital Broadcast Network (DBN).